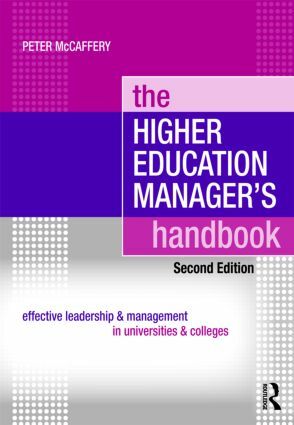 The Higher Education Manager’s Handbook has been substantially updated and reflects important changes that have occurred since its first publication in 2004. In this new edition, Peter McCaffery continues to draw on a wealth of US and UK case studies based in innovative practice. The book offers counsel and guidance on all aspects of the manager’s role and provides the navigational tools to successfully operate where the legitimacy of "management" has often been questioned. New chapters: "Leading and Celebrating Diversity" and "Enhancing the Student Experience"
Higher Education Managers, Team Leaders, Vice Chancellors, Provosts, University Presidents, Department Heads and Student Affairs Administrators will find this book to be an irreplaceable resource.